I am super excited because today I got to do some colourful freehand nail art that I didn't immediately remove and replace with something else! It's been a bit of a swatch factory here lately (some of which you'll have seen, some still to come) so it was great to sit down and appreciate something for longer than the time it takes to get some good pictures. 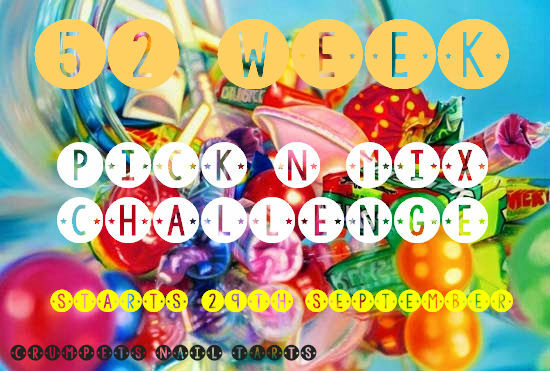 So, of course, this is for the Pick n Mix challenge. Themes this week are Geometric (YAY!) and Yellow, Blue & Green. I love geometric anything so I've been looking forward to this week! 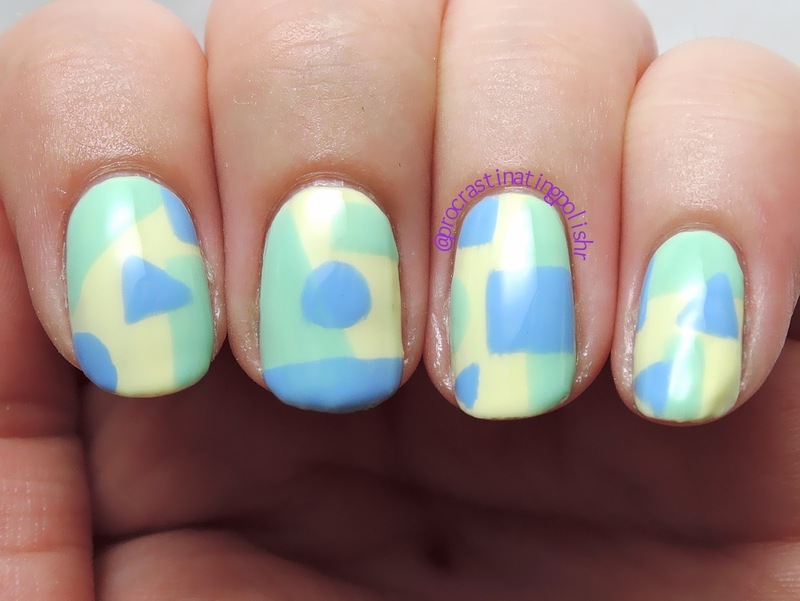 Given I have amazing new yellow and green cremes from Grace-full I thought I'd put them to the nail art test and pair soft pastels with bold geometric shapes. So many options to consider - stamping, striping tape, vinyls... nah, just go wild and freehand! I put down a base of Grace-full Brooke, and freehanded some blocks of green with Anne. I added in more shapes with a detail brush using Barry M Blueberry. I am loving the brush set I got from Winstonia recently - a quick oil after cleaning and they have stayed soft and held shape perfectly with no bristle loss. I am super into this look but am regretting the circle. Should have stuck with the hard edges. There is a definite lack of triangles here too, what is even happening to me? I have a crisis happening on my middle nail at the moment - it broke in the most counter-productive way possible by somehow having a big scoop taken out of the tip - like a tiny creature took a clean bite out of my nail. My repair job was... sturdy... but not exactly smooth. It's so close to grown out I'm just dealing with my bizarre fat nail. And please, feel free to ignore my pinky dent. Someone was feeling lazy tonight. But wait - before you leave, check out everyone else below! Thank you :D I really like these colours too, the green is just gorgeous!